You asked for it and I listened. For my customers with small dogs, the big bone shaped doggie soaps were just TOO BIG so they were cutting them into smaller pieces. 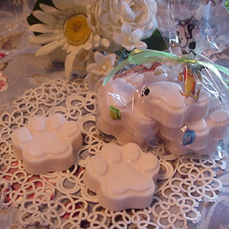 Here is a package with five (5) cute paw print shaped doggie soaps that weigh approximately 1 oz. each and measure 2 1/2" across, 2" high and just over 1/2" thick. They are also made with my high quality glycerine soap base that I added a small amount of organic rosemary, lavender and cedarwood essential oils to. 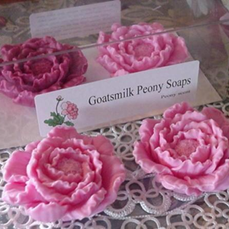 I also added a very tiny amount of FDA approved soap colorant to make them bone colored just like the big doggie soaps. These are packaged in a cute doggy print cellophane bag that are finished off with a green piece of curling ribbon.